This article is about the de facto region. For the former province, see Al-Jazira Province. The three regions of the Autonomous Administration of North and East Syria: Afrin Region (orange), Euphrates Region (red) and Jazira Region (green). Jazira Region, formerly Jazira Canton, (Kurdish: Herêma Cizîrê‎, Arabic: إقليم الجزيرة‎, Classical Syriac: ܦܢܝܬܐ ܕܓܙܪܬܐ‎, translit. Ponyotho d'Gozarto), is the largest of the three regions of the de facto autonomous Autonomous Administration of North and East Syria. As part of the ongoing Rojava campaign, its democratic autonomy was officially declared on 21 January 2014. The region was established on the Al-Hasakah Governorate formerly known as Al-Jazira Province of Syria. According to the constitution, the city of Qamishli is the administrative center of Jazira Region. However, as parts of Qamishli remain under the control of Syrian government forces, meetings of the autonomous region's administration take place in the nearby city of Amuda. The region has two subordinate cantons, the Hasakah canton consisting of the al-Hasakah area (with the Al-Shaddadi, Al-Arisha and Al-Hawl districts subordinate to it), Serê Kaniyê area (with the Zirkan district subordinate to it), Ad-Darbasiyah area, and Tel Tamir area, as well as the Qamishli canton consisting of the Qamishli area (with the Amûda, Tirbê Sipî, Tel Hemîs and Tel Berak districts subordinate to it) and Derik area (with the Girkê Legê, Tel Koçer and Çilaxa districts subordinate to it). Jazira Region encompasses the area of Al-Hasakah Governorate except for Nahiya Markada of the Al-Hasakah District at the southernmost tip and Nahiya Ras al-Ayn of the Ras al-Ayn District at the westernmost tip. The region is bordered by Mardin and the western part of Şırnak Provinces of Turkey to the north, and Iraq to the east. Jazira Region's population is ethnically composed of Kurds, Arabs, Assyrians, Armenians and Yazidis. While Kurdish, Arabic and Syriac are official languages, all communities have the right to teach and be taught in their native language. Religions practiced in the region are Islam, Christianity and Yazidism. The majority of the Arabs and Kurds in the region are Sunni Muslim and between 20-30% of the people of Al-Hasakeh city are Christians of various churches and denominations. Cities and towns with more than 10,000 inhabitants according to the 2004 Syrian census are Hasakah (188,160), Qamishli (184,231), Ras al-Ayn (29,347), Amuda (26,821), Al-Malikiyah (26,311), Al-Qahtaniyah (16,946), Al-Shaddadah (15,806), Al-Muabbada (15,759), Al-Sabaa wa Arbain (14,177) and Al-Manajir (12,156). In the late 10th century , the Kurdish Humaydi tribe had their winter pastures in the Jazira region and clashed with forces of Buyid ruler Adud al-Dawla. During the Ottoman Empire (1299–1922), large Kurdish-speaking tribal groups both settled in and were deported to areas of northern Syria from Anatolia. The largest of these tribal groups was the Reshwan confederation, which was initially based in Adıyaman Province but eventually also settled throughout Anatolia. The Milli confederation, mentioned in 1518 onward, was the most powerful group and dominated the entire northern Syrian steppe in the second half of the 18th century. Danish writer C. Niebuhr who traveled to Jazira in 1764 recorded five nomadic Kurdish tribes (Dukurie, Kikie, Schechchanie, Mullie and Aschetie) and six Arab tribes (Tay, Kaab, Baggara, Geheish, Diabat and Sherabeh). According to Niebuhr, the Kurdish tribes were settled near Mardin in Turkey, and paid the governor of that city for the right to graze their herds in the Syrian Jazira. The Kurdish tribes gradually settled in villages and cities and are still present in Jazira (modern Syria's Hasakah Governorate). The Ottoman province of Diyarbekir, which included parts of modern-day northern Syria, was called Eyalet-i Kurdistan during the Tanzimat reforms period (1839–67). Until the 19th century, Kurdistan did not include the lands of Syrian Jazira in some books. 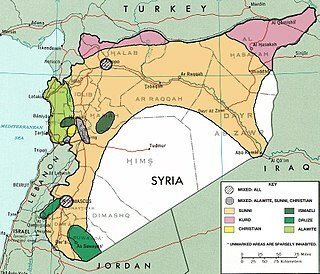 [note 1] The Treaty of Sèvres' putative Kurdistan did not include any part of today's Syria. According to McDowall, Kurds slightly outnumbered Arabs in Jazira in 1918. The demographics of Northern Syria saw a huge shift in the early part of the 20th century when the Ottoman Empire (Turks) conducted ethnic cleansing of its Armenian and Assyrian Christian populations and some Kurdish tribes joined in the atrocities committed against them. Many Assyrians fled to Syria during the genocide and settled mainly in the Jazira area. Until the 19th century, Kurdistan did not include the lands of Syrian Jazira in some books. [note 2] According to McDowall, Kurds slightly outnumbered Arabs in Jazira in 1918. Starting in 1926, the region saw huge immigration of Kurds following the failure of the Sheikh Said rebellion against the Turkish authorities. While many of the Kurds in Syria have been there for centuries, waves of Kurds fled their homes in Turkey and settled in Syria, where they were granted citizenship by the French mandate authorities. This large influx of Kurds moved to Syria’s Jazira province. It is estimated that 25,000 Kurds fled at this time to Syria. In the late 1930s a small but vigorous separatist movement emerged in Qamishli. With some support from French Mandate officials, the movement actively lobbied for autonomy direct under French rule and separation from Syria on the ground that majority of the inhabitants were not Arabs. Syrian nationalists saw the movement as a profound threat to their eventual rule. The Syrian nationalists allied with local Arab Shammal tribal leader and Kurdish tribes. They together attacked the Christian movement in many towns and villages. Local Kurdish tribes who were allies of Shammar tribe sacked and burned Assyrian town of Amuda. In 1941, the Assyrian community of al-Malikiyah was subjected to a vicious assault. Even though the assault failed, Assyrians felt threatened and left in large numbers, and the immigration of Kurds from Turkey to the area converted al-Malikiya, al-Darbasiyah and Amuda to Kurdish-majority cities. According to the French report to the League of Nations in 1937, the population of Jazira consisted of 82,000 Kurdish villagers, 42,000 Muslim Arab pastoralists, and 32,000 Christian town dwellers (Assyrians and Armenians). Between 1932 and 1939, a Kurdish-Christian autonomy movement emerged in Jazira. The demands of the movement were autonomous status similar to the Sanjak of Alexandretta, the protection of French troops, promotion of Kurdish language in schools and hiring of Kurdish officials. The movement was led by Michel Dome, mayor of Qamishli, Hanna Hebe, general vicar for the Syriac-Catholic Patriarch of Jazira, and the Kurdish notable Hajo Agha. Some Arab tribes supported the autonomists while others sided with the central government. In the legislative elections of 1936, autonomist candidates won all the parliamentary seats in Jazira and Jarabulus, while the nationalist Arab movement known as the National Bloc won the elections in the rest of Syria. After victory, the National Bloc pursued an aggressive policy toward the autonomists. The Jazira governor appointed by Damascus intended to disarm the population and encourage the settlement of Arab farmers from Aleppo, Homs and Hama in Jazira. In July 1937, armed conflict broke out between the Syrian police and the supporters of the movement. As a result, the governor and a significant portion of the police force fled the region and the rebels established local autonomous administration in Jazira. In August 1937 a number of Assyrians in Amuda were killed by a pro-Damascus Kurdish chief. In September 1938, Hajo Agha chaired a general conference in Jazira and appealed to France for self-government. The new French High Commissioner, Gabriel Puaux, dissolved parliament and created autonomous administrations for Jabal Druze, Latakia and Jazira in 1939 which lasted until 1943. All four main ethnic communities (Kurds, Arabs, Armenians and Assyrians/Syriacs) are represented in the 101-seat Legislative Assembly. The current prime minister (sometimes referred to as president) of Jazira Canton is the Kurdish Akram Hesso with Arab Hussein Taza Al Azam and Assyrian Elizabeth Gawrie as deputy prime ministers (sometimes referred to as vice-presidents). There are people's councils but it is unclear how they relate to the transitional government. There also appear to be co-governor/co-president positions, with tribal leader and Al-Sanadid Forces leader Humaydi Daham al-Hadi and Hediye Yusuf being co-governors of the region. In January 2016, Jazira Canton introduced a "self-defense duty" conscription law for its self-defence forces, including an avoidance fee for residents of age for mandatory military service who have moved to Europe, to pay $200 for each year of absence upon their return. In September 2015, the legislative council passed the Law for the Management and Protection of the Assets of the Refugees and the Absentees, under which a real estate owner loses title when he does not make personal use of the property. In particular among the Assyrian community in Jazira Region, persistent opposition was voiced, as their community is disproportionally hit by the measure, for both a high degree of real estate ownership and a particularly high share of outbound civil war refugees. Assyrian organizations of the region published several statements making accusations of seizing private property, demographic changing and ethnic cleansing. Assets seized from Assyrians under the law have reportedly since been handed over to Assyrian churches. Security is maintained by the Asayish police force and its Assyrian counterpart, the Sutoro. Syrian government loyalists only control a number of demarcated neighborhoods in Qamishli. The government-held areas in Qamishli include the city's airport, the city's train station, the border crossing, the governor's palace, and many other residential neighborhoods with various governmental buildings such as hospitals and fire departments. The economy of Jazira Canzon mainly based on agriculture, it accounts for 17 percent of Syria's agricultural production, in particular wheat and cotton grown there in abundance. Being the "bread basket" of Syria, wheat production before the Syrian Civil War used to be around 1,8 million tons per year, at the height of the war however dropping as low as 0,5 million tons. The Economy Committee promotes varied vegetable and fruit cultivation instead of the mono-culture of wheat; in Amuda a centre to develop seedlings has been created. Development of a greenhouse economy is promoted. In Al-Qahtaniyah, an ecological village was founded so that local Rojavan population can acquire experience in ecology from international volunteers. The only significant industrial area is in Hasakah. Jazira Region is home to several oil fields, among them Syria's best producing at Rmelan. As of summer 2016, oil output in Jazira Region was estimated at around 40,000 barrels per day. Some people work at primitive oil refining, which causes health hazards and pollution. The oil wealth in combination with the economic blockade of Rojava from the adjacent territories controlled by Turkey and ISIL, and partially also the KRG, results in a distortion of relative prices; petrol costs only half as much as bottled water. Electricity is supplied by Tishrin Dam on the Euphrates, within Euphrates Region; apart from that, electricity is produced by diesel generators. In July 2017, Jazira Region became the first region in the Autonomous Administration of North and East Syria to introduce an income tax, with citizens' income of above 100,000 Syrian pound (at the time equivalent to around 200 U.S. dollar) per month to be taxed. Like in the other Rojava regions, primary education in the public schools is initially by mother tongue instruction either Kurdish or Arabic, with the aim of bilingualism in Kurdish and Arabic in secondary schooling. Curricula are a topic of continuous debate between the regions' Boards of Education and the Syrian central government in Damascus, which partly pays the teachers. In August 2016, the Ourhi Centre in the city of Qamishli was founded by the Assyrian community, to educate teachers in order to make the Syriac-Aramaic an additional language to be taught in public schools in Jazira Region, which then started with the 2016/17 academic year. With that academic year, states the Rojava Education Committee, "three curriculums have replaced the old one, to include teaching in three languages: Kurdish, Arabic and Assyrian." The federal, regional and local administrations in Rojava put much emphasis on promoting libraries and educational centers, to facilitate learning and social and artistic activities. One cited example is the 2015 established Nahawand Center for Developing Children’s Talents in Amuda. The Jazira Region Board of Education operates two public institutions of higher education, the University of Rojava and the Mesopotamian Social Sciences Academy, both in the city of Qamishli. Jazira Region houses a third one, the Hasakah campus of Al-Furat University, which is operated by the Damascus government Ministry of Higher Education. ^ Modern Curdistan is of much greater extent than the ancient Assyria, and is composed of two parts, the Upper and Lower. In the former is the province of Ardelaw, the ancient Arropachatis, now nominally a part of Irak Ajami, and belonging to the north-west division called Al Jobal. It contains five others, namely, Betlis, the ancient Carduchia, lying to the south and south-west of the lake Van. East and south-east of Betlis is the principality of Julamerick—south-west of it, is the principality of Amadia—the fourth is Jeezera ul Omar, a city on an island in the Tigris, and corresponding to the ancient city of Bezabde—the fifth and largest is Kara Djiolan, with a capital of the same name. The pashalics of Kirkook and Solimania also comprise part of Upper Curdistan. Lower Curdistan comprises all the level tract to the east of the Tigris, and the minor ranges immediately bounding the plains, and reaching thence to the foot of the great range, which may justly be denominated the Alps of western Asia. A Dictionary of Scripture Geography (1846), John Miles. ^ a b "Al-Qamishli to be capital city of Jazeera Canton in Syrian Kurdistan". Firat News. 26 January 2014. ^ a b "The Constitution of the Rojava Cantons". Personal Website of Mutlu Civiroglu. ^ "Al-Hasakeh Governorate profile" (PDF). www.acaps.org. ^ Asa Eger, A. (2015). The Islamic-Byzantine Frontier: Interaction and Exchange Among Muslim and Christian Communities. I.B.Tauris. p. 269. ISBN 9781780761572. ^ Carsten Niebuhr (1778). Reisebeschreibung nach Arabien und andern umliegenden Ländern. (Mit Kupferstichen u. Karten.) - Kopenhagen, Möller 1774-1837 (in German). p. 419. ^ Kreyenbroek, P.G. ; Sperl, S. (1992). The Kurds: A Contemporary Overview. Routledge. p. 114. ISBN 0415072654. ^ Carsten Niebuhr (1778). Reisebeschreibung nach Arabien und andern umliegenden Ländern. (Mit Kupferstichen u. Karten.) - Kopenhagen, Möller 1774-1837 (in German). p. 389. ^ Stefan Sperl, Philip G. Kreyenbroek (1992). The Kurds a Contemporary Overview. London: Routledge. pp. 145–146. ISBN 0-203-99341-1. ^ Jongerden, Joost; Verheij, Jelle (2012). Social Relations in Ottoman Diyarbekir, 1870-1915. BRILL. p. 6. ISBN 9789004225183. ^ a b c d John R. Miles (1846). A Dictionary of Scripture Geography. Fourth edition. J. Johnson & Son, Manchester. p. 57. ^ David McDowall (2004). A Modern History of the Kurds: Third Edition. p. 137. ^ a b David McDowall (2004). A Modern History of the Kurds: Third Edition. p. 469. ^ Hovannisian, Richard G. (2007). The Armenian Genocide: Cultural and Ethical Legacies. Archived from the original on 11 May 2016. Retrieved 11 November 2014. ^ Joan A. Argenter, R. McKenna Brown (2004). On the Margins of Nations: Endangered Languages and Linguistic Rights. p. 199. ^ Lazar, David William, not dated A brief history of the plight of the Christian Assyrians* in modern-day Iraq Archived 2015-04-17 at the Wayback Machine. American Mespopotamian. ^ a b R. S. Stafford (2006). The Tragedy of the Assyrians. p. 24. ^ Dawn Chatty (2010). Displacement and Dispossession in the Modern Middle East. Cambridge University Press. pp. 230–232. ISBN 978-1-139-48693-4. ^ McDowell, David (2005). A modern history of the Kurds (3. revised and upd. ed., repr. ed.). London [u.a. ]: Tauris. p. 469. ISBN 1850434166. ^ Bat Yeʼor (2002). Islam and Dhimmitude: Where Civilizations Collide. p. 159. ^ Tejel, Jordi (2008). Syria's Kurds: History, Politics and Society. p. 147. ^ Keith David Watenpaugh (2014). Being Modern in the Middle East: Revolution, Nationalism, Colonialism, and the Arab Middle Class. p. 270. ^ McDowell, David (2004). A modern history of the Kurds. Tauris. p. 470. ^ Tejel, Jordi (2008). Syria's Kurds: History, Politics and Society. Routledge. pp. 29, 30, 35. ^ Romano, David; Gurses, Mehmet (2014). Conflict,Democratization, and the Kurds in the Middle East: Turkey, Iran, Iraq, and Syria. Palgrave Macmillan. pp. 88–89. ^ Jwaideh, Wadie (2006). The Kurdish National Movement: Its Origins and Development. Syracuse University Press. p. 146. ^ McDowell, David (2004). A modern history of the Kurds. Tauris. p. 471. ^ Tejel, Jordi (2008). Syria's Kurds: History, Politics and Society. Routledge. p. 36. ^ "Declaration of democratic autonomy in Cizîre canton". Archived from the original on 2014-12-23. ^ Karlos Zurutuza (28 October 2014). "Democracy is "Radical" in Northern Syria". Inter Press Service. ^ "YPG, backed by al-Khabour Guards Forces, al-Sanadid army and the Syriac Military Council, expels IS out of more than 230 towns, villages and farmlands". Syrian Observatory For Human Rights. 28 May 2015. Archived from the original on 29 May 2015. Retrieved 28 February 2017. ^ Gupta, Rahila (9 April 2016). "Rojava's commitment to Jineolojî: the science of women". openDemocracy. Retrieved 28 February 2017. ^ "SDF plays central role in Syrian civil war" (PDF). IHS Jane's 360. IHS. 20 January 2016. pp. 3–4. Retrieved 28 February 2017. ^ "Sanadid fighters promote their participation in Wrath of Euphrates". Hawar News Agency. 9 January 2017. Retrieved 28 February 2017. ^ Hubbard, Ben (2 November 2015). "New U.S.-backed alliance to counter ISIS in Syria falters". The New York Times. Retrieved 3 November 2015. ^ "canton imposes new 'luxury' tax on residents living in Europe". Syria Direct. ^ a b c d "NO GOING BACK: WHY DECENTRALISATION IS THE FUTURE FOR SYRIA" (PDF). European Council on Foreign Relations. September 2016. ^ "Assyrian leader accuses PYD of monopolizing power in Syria's north". ARA. 23 March 2016. ^ Carl Drott (6 March 2014). "A Christian militia splits in Al-Qamishli". Carnegie Endowment. ^ a b "Will Syria's Kurds succeed at self-sufficiency?". Al-Monitor. 3 May 2016. ^ a b c d e "Rojava: The Economic Branches in Detail". cooperativeeconomy.info. 14 January 2017. Retrieved 16 January 2017. ^ "The Greenhouse Project". cooperativeeconomy.info. 24 April 2016. Retrieved 16 January 2017. ^ "Control of Syrian Oil Fuels War Between Kurds and Islamic State". The Wall Street Journal. 23 November 2014. ^ "Rojava Administration to impose tax system in northern Syria". ARA News. 10 July 2017. ^ "Education in Rojava after the revolution". ANF. 2016-05-16. Retrieved 2016-06-10. ^ "After 52-year ban, Syrian Kurds now taught Kurdish in schools". Al-Monitor. 2015-11-06. Retrieved 2016-05-18. ^ a b "Hassakeh: Syriac Language to Be Taught in PYD-controlled Schools". The Syrian Observer. 3 October 2016. Retrieved 2016-10-05. ^ "Kurds introduce own curriculum at schools of Rojava". Ara News. 2015-10-02. Retrieved 2016-05-18. ^ "Revolutionary Education in Rojava". New Compass. 2015-02-17. Retrieved 2016-05-10. ^ "Education in Rojava: Academy and Pluralistic versus University and Monisma". Kurdishquestion. 2014-01-12. Retrieved 2016-05-18. ^ "The Syriacs are taught their language for the first time". Hawar News Agency. 2016-09-24. Retrieved 2016-09-24. ^ "Rojava administration launches new curriculum in Kurdish, Arabic and Assyrian". ARA News. 7 October 2016. Retrieved 2016-10-07. Qamishli is a city in northeastern Syria on the border with Turkey, adjoining the Turkish city of Nusaybin, and close to Iraq. According to the 2004 census, Qamishli had a population of 184,231. Qamishli is 680 kilometres (420 mi) northeast of Damascus. Al-Hasakah also known as Al-Hasakeh, Al-Hasaka or simply Hasakah, is the capital city of the Al-Hasakah Governorate and it is located in the far northeastern corner of Syria. With a population of 188,160 residents in 2004, Al-Hasakah is among the ten largest cities in Syria and the largest in the governorate. It is the administrative center of a nahiyah ("subdistrict") consisting of 108 localities with a combined population of 251,570 in 2004. Amuda is a town in Al Hasakah Governorate in northeastern Syria close to the border with Turkey. As a preliminary result of the ongoing Syrian Civil War, Amuda today is situated in Jazira Region within the autonomous Democratic Federation of Northern Syria framework. Al-Malikiyah is a small Syrian city and the center of an administrative district belonging to Al-Hasakah Governorate. The district constitutes the northeastern corner of the country, and is where the Syrian Democratic Council convenes. The town is about 20 km (12 mi) west of the Tigris river which defines the triple border between Syria, Turkey and Iraq. According to the Syria Central Bureau of Statistics (CBS), Al-Malikiyah had a population about 40,000 residents in the 2012 census. It is the administrative center of a nahiyah ("subdistrict") consisting of 108 localities with a combined population of 125,000.The population enjoys demographic and ethnic diversity that is characteristic of most of Al-Hasakah Governorate. The town is inhabited by Kurds, Assyrians, Arabs and Armenians. The Syriac Security Office, commonly known as the Sutoro or the Sutoro Police, is an ethnic Assyrian, Syriac-Christian police force in Jazira Canton of the Democratic Federation of Northern Syria in Syria, where it works in concert with the general Asayish police force of the canton with the mission to police ethnic Assyrian areas and neighbourhoods. Its establishment is associated with the Syriac Union Party (SUP). Euphrates Region, formerly Kobanî Canton,, is the central of three regions of the de facto autonomous Autonomous Administration of North and East Syria, factually comprising Ayn al-Arab District of the Aleppo Governorate, Tell Abyad District of the Raqqa Governorate, and the westernmost tip of Nahiya Ras al-Ayn of the Ras al-Ayn District of Al-Hasakah Governorate. Euphrates Region unilaterally declared autonomy in January 2014 and since de facto is under direct democratic government in line with the polyethnic Constitution of Rojava. In the de facto autonomous Rojava region of northern Syria, the very first local elections took place on Friday, 13 March 2015. The municipal governments in the three predominantly Kurdish cantons Cizîrê, Kobanî and Afrin were to be elected. A number of Christian militias in Iraq and Syria have been formed since the start of the Syrian Civil War and Iraq Civil War in the 2010s. The militias are composed of fighters from the various Syriac/Assyrian, Arab and Armenian Christian communities in Syria, and are also found amongst Assyrian communities in neighbouring northern Iraq; a number of foreign Christian fighters from the Western World have also joined these militias. 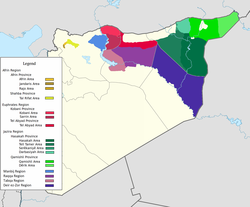 The Kurdish National Alliance in Syria is a Syrian Kurdish coalition formed by five Syrian Kurdish parties in the city of Amuda in the al-Hasakah Governorate of northeastern Syria in 13 February 2016. Four of the five parties in the coalition were originally members of the Kurdish National Council, but were expelled due to their cooperation with the Democratic Union Party (PYD). The first local elections in the Democratic Federation of Northern Syria were held on 22 September 2017. Representatives of 3,700 communes in the regions of the Northern Syria Federation are to be selected in the election, involving 12,421 candidates. The communal elections on 22 September were followed by elections of local councils in December and a federal parliamentary election of the People's Democratic Council, the region's highest governing body in 2018. Several areas controlled by the Syrian Democratic Forces are excluded from the election, including the cities of Manbij and Raqqa.